"Veteran Show Brings Updated Laughs"
In an already-politicized world of “fake news,” where does one of the original biting comedies about Washington fit in? That’s the question viewers face as CBS relaunches Murphy Brown (9:30 Eastern/8:30 Central) on Thursday in a Donald Trump world. For 288 episodes in the late 1980s to late 1990s, the show parodied, but also advocated, for journalism with a fiery storyteller who frequently got in trouble by doing things that today would more often be considered absolutely tame. So how would that character or show even fit in during today’s news cycle? The answer, it seems, is it hasn’t lost much of a beat. And that is both the strength and the weakness of the new Murphy Brown reboot on CBS. Like the actors, the show has aged. Plot-wise, the pilot’s premise follows a retired Murphy Brown (Candice Bergen) who decides that today’s political climate is just too irresistible (or perhaps too depressing) to not be on the air, so she comes out of retirement and now heads a morning talk show. Her son Avery Brown (Jake McDorman) (yes, the character that was once the fictional baby that Dan Quayle complained about in the famous “single mom” incident) unknowingly decides to take a job at the rival “Wolf” network, a conservative Fox-like channel during the same morning time-slot as his mother. 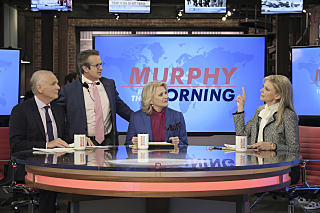 Murphy’s producer Miles Silverberg (Grant Shaud), now living in the Watergate Hotel, is as paranoid as ever, and Murphy’s co-workers Corky Sherwood (Faith Ford) and Frank Fontana (Joe Regalbuto) continue as fellow-journalists and often co-conspirators to Murphy’s shenanigans. The biggest change involves the bar/diner they hang out at the end of the day. 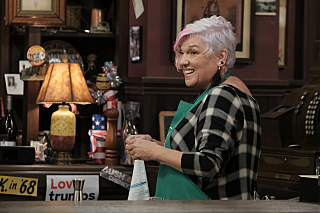 Phil’s Bar and Grill is now run by Phyllis (6-time Emmy winner Tyne Daly), as she takes over the bar from her brother. Daly is sarcastic but still warm (like most of the other characters on the show), and is a fitting tribute to replace the late Pat Corley, who passed away in 2006. Also new to Murphy’s news-team is the off-camera Pat Patel (Nik Dodani), who plays the Social Media Director and tech support person for the crew. He constantly worries about tweets, Facebook profiles, and media presences, and even helps makes Murphy fake White House press credentials--something most of us should ask about at work the next time we see our own IT folks. There are some issues that have grown old. Continual jokes about the characters’ inability to use technology today seem odd and demean the idea that older journalists can understand technology. To think a character like Murphy Brown wouldn’t be able to successfully use a modern day cell phone seems out of character and unrealistic. And, as always, Murphy is continually looking for new secretaries. The first episode featured a surprise guest-star in Hillary Clinton (not playing herself but a secretary simply named “Hillary”) who nevertheless poked fun at herself with lines like “I do have experience with emails” and boasting her own email address at “Hillary at youcouldofhadme.com” Still, other than the guest-star power of Clinton on the pilot, the old routine of Murphy hiring or firing secretaries may seem outdated in 2018, when journalists not only file their own stories but often do their own camerawork and post their own online stories as well. (The original run on CBS had Murphy feature about 93 secretaries). Maybe it’s time for this Murphy Brown to rid itself of the secretary trope. But what started as a safe, familiar but outdated show in the pilot did become a more politically relevant show by the second episode. That episode involved Murphy becoming jealous her son, from a rival network, would be inside for his first White House press briefing. Murphy, of course, has been kicked out of press briefings, so she launches an elaborate plan with her newscast members to “get her inside” the next press briefing at the White House. When she eventually gets in (with fake Le Monde credentials named Cousette Peugeot - which makes her wonder if she came from the “Jean Valjean Academy of Stolen Bread”) she does the typical Murphy Brown thing: refuse to back down and asks questions even when she isn’t called upon by White House Press Secretary Sarah Huckabee Sanders. Why do you lie? That line lingers. Even after the show ends. And in that moment, Murphy Brown becomes instantly relevant. The humor may not be completely biting--but it was important. And necessary. Will the show be too liberal for CBS? Probably not--because Murphy Brown, unlike some shows, backs down just enough to make it all a good episode of fun. The characters genuinely care about each other, care about the country, and admit when they go too far. We like our journalists as crusaders. But we like our journalists to be a bit humble, too. And the second episode still puts Murphy in her place after making an important commentary. Before getting kicked out of the White House (again), Murphy scolds her fellow press corps members, “I know a lot of you personally” but when they don’t come to her aid, “Maybe I don’t know you as well as I thought I did.” It is a biting line about how the press in Washington lets the White House Press Secretary regularly lie to the public without using the “L” word. Even if it’s a fictional voice of reason, it was great to see Murphy critique the White House press office. And it was great to see Murphy critique the press. And the beauty of the show: it was still tremendously entertaining. We need more Murphy Browns in real life--but until we get them, we should celebrate that while this show is aging, it is clearly still relevant. It's funny and appropriate. A rare blend that only network TV can still bring.